The People + Planet Project (P+PP) is a new global action network designed to activate the Climate Agreements and SDGs post–2015. The P+PP will mobilize large-scale campaigns that collectively will support these shared goals and provide users with content, tools and calls to action to integrate sustainable, socially responsible decisions into their everyday lives. The P+PP’s users will be an unprecedented coalition of civil societies, organizations, brands and NGOs that will engage in and facilitate this universal transformation. This robust platform will carry the momentum of the Climate Agreements and SDGs beyond 2015 to ensure that these are sustained priorities, leaving no one behind. A foundational aspect in our ideation is the P+PP Systems Map, included to the right, which illustrates our systematic, strategic approach. 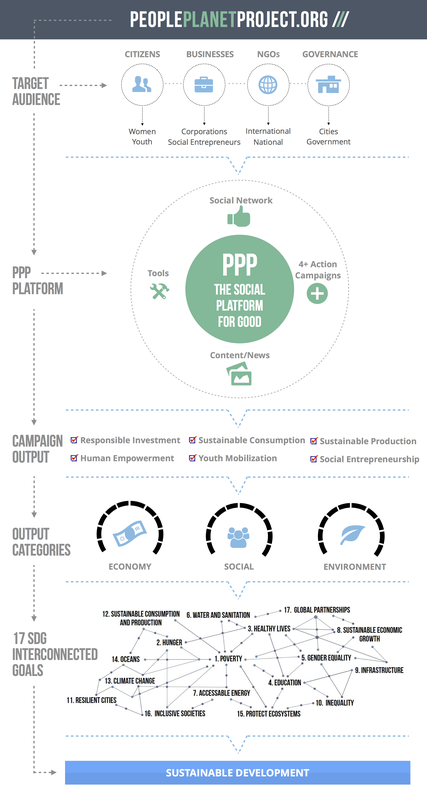 This map provides a flow of the P+PP’s target audiences, the platform, campaign output, output categories, the 17 interconnected SDGs and the final outcome: Sustainable Development. Phase one of the P+PP will be unveiled September 1, 2015, at the beginning of the month of the SDGs. This phase will be dedicated to the P+PP’s Founding Members, the P+PP coalition, and will welcome people, organizations, NGO and businesses to create their profiles and enter in basic information about their interests, passions and work. It will be a place for the first members of the P+PP community to connect and highlight their sustainable, socially responsible livelihoods. These Founding Members will receive special incentives to join at this early phase, and have first access to tools and information regarding the SDGs and COP21. The full P+PP platform will launch during COP21, the exact date TBD. Every Dollar You Spend Is A Vote: On January 1, 2016, the P+PP’s first action campaign will launch, an economic-focused campaign called Every Dollar You Spend Is A Vote (Every Dollar). Every Dollar will be a convening platform that provides the tools to enable citizens, brands and investors to make conscious decisions, and to understand that every dollar they spend is a vote for the world they want to see. Next: In April 2016, a campaign called Next will launch. Next will be a social campaign that will give youth a global forum to be heard. It will be a place for youth to share photography and international knowledge, a place for youth to educate their peers and to be empowered. Pivotal: The following social campaign, Pivotal, will launch in July 2016. Pivotal will be a platform designed to help millennials become social entrepreneurs, empowered contributors and front runners in global society. From Harm To Good: The fourth action campaign scheduled to launch in 2016 is called From Harm To Good (From To). Launching in October, it will be a platform to help companies shift their business model to divest from harm and invest in sustainable business practices. These four initial P+PP campaigns will galvanize action and make certain the SDGs and Climate Agreements are attended to post–2015, reflected across all nations. The feedback we received during this discussion was thoughtful and constructive, and allowed us to solidify and determine outcomes that are integral to the P+PP platform. Self-Sustaining Model: The P+PP will function as a self-sustaining platform that has the capacity to fund innovative projects and initiatives developed by P+PP members. Using profits generated over time, the P+PP will establish and implement a global fund to invest in solutions to the SDGs cultivated from the minds of the P+PP community. This will allows members to showcase their ingenuity, collaborate and co-create with others and become empowered social entrepreneurs. This model will help the next generation of entrepreneurs create businesses that benefit and regenerate the world, perpetuating a cycle of both consciousness and wealth. Collaboration: The P+PP is meant to be a collaborative space that welcomes all initiatives’ participation. This platform will highlight the work of global initiatives and projects to bring them the highest degree of support and recognition. We will reach out to organizations and NGOs to invite them to take part in the P+PP and engage with this new community to share their work, goals and achievements. The P+PP is designed to be a collaborative environment where post–2015 initiatives are free to take part in and benefit from. Initial Engagement: The P+PP’s initial users are people and organizations who want a new platform that provides meaningful engagement and real calls to action that empower them to support the most crucial goals affecting the future of the planet and its people. As an action platform and collaborative space, the P+PP offers new incentives for users to join, create a profile and engage. Inherent curiosity coupled with the will to regenerate the earth will result in people joining the P+PP and discovering how it allows them to support the SDGs and Climate Agreements post–2015. Sustained Engagement: As the P+PP matures, more robust options to engage in the platform will be provided to sustain users’ interest and engagement. Content and tools will be provided that enable the P+PP community to enhance their level of social responsibility and sustainable existence. P+PP users will be able to share their actions on the P+PP on the social networks they participate in, to broadly cross-communicate with their followers and audiences. In time, the P+PP will grow and populate with an international community, an unprecedented global coalition united to achieve shared goals that affect future generations of all nations. Partners and Ambassadors: As the P+PP continues to develop, we seek brands and organizations to partner with to foster this new platform. Our partners will play an integral role in ensuring the P+PP thrives this year and beyond. We are also identifying potential P+PP ambassadors who share our values and embody a socially conscious global citizen. Our ambassadors will represent a diverse international citizenship, each with his or her own unique commitment to regenerating the planet and revolutionizing how future generations exist. We will identify socially relevant, universally appealing individuals who are a good fit to represent the P+PP. One person who was repeatedly suggested during the discussion was John Oliver. Mr. Oliver is widely esteemed for his witty commentary on global issues, including the foundations of Sustainable Development (economic, social and environmental). We welcome your ideas for potential partners and ambassadors for the P+PP. Student Mobilization: International colleges and universities will be integral to the P+PP. We will reach out to centers of higher education to engage their active participation in the platform and the campaigns released. In the coming weeks, we will engage will different UN agencies and other organizations to become part of a P+PP Planning Committee, which will discuss concrete steps forward in alignment with each agency’s and organization’s goals in accordance with the P+PP’s timeline. We welcome the collaboration and support of: UN Global Compact; UN Women; UNDPI; UNCCST; UN Post–2015 Development Planning Team; UNF; UN Envoy of Youth; UNOP; and other agencies and organizations who share our values and want to achieve shared universal goals. In particular, we aim to connect with the UN Millennium Campaign to explore potential engagements with the P+PP through the World We Want platform and other initiatives. We also welcome the involvement from Citizen Engagement and Advocacy, and are eager to collaborate with organizations who want to join the P+PP coalition and help fulfill the SDGs and Climate Agreements. The People+Planet Project “Global Coalition” that will serve a catalyst for action following the announcement of the United Nations New Sustainable Development Goals and the new Climate Agreements in 2015. With a major Degree in Communications and Marketing, I started in the Advertising world when I was very young working for “Ogilvy” and “Publicis” establishing my career as TV Commercial Producer . Along the years I combined my experience working for the Entertainment Industry, Commercial Production and as a Freelance Producer for the Advertising Industry, acquiring unique skills that will help shape my career as an Integrative Producer in amazing ways. As a seasoned commercial producer, I received awards and recognition from The Clio Festival, New York Festival and Fiap among others. My Advertising agency experience includes working for Fortune 500 Companies accounts such as: Verizon Wireless, Verizon Residential, Anheusher Busch/ Budweiser, Miller Coors Brewing Company, Procter and Gamble, Splenda, General Motor, Allstate Insurance, Bally Total Fitness,Sears, Honda Motors, Pepsi, Wallmart among others. Currently I combined my production experience in the Advertising Industry with the development of ” The Global Brain Network”, gathering the creative Industry with the most environmental, social and sustainable causes; and “Humanity 2.0” a Documentary Film that will integrated our world , environment and health”. Environmentalist and Ocean protector, Natalia currently lives in Stevenson Ranch, California with her husband Daniel and their beloved puppies.